Actually gaining safe access to a roof is where our height safety solutions begin. Choose from our wide range of caged ladders, fixed rung ladders, caged ladders, platform ladders, static line ladders and permanent steps. Designed to suit a variety of applications and installations, commercial and industrial rated, our roof access hatches are custom fabricated to suit a range of sizes. 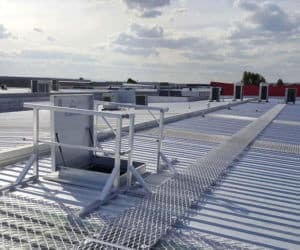 With roof platforms and walkways available in both aluminium and FRP finishes, our roof platforms and roof walkways are designed to provide safe, cost effective and maintenance free access to all rooftops. They offer maintenance personnel a slip resistant and designated walkway and landing area on roof areas. 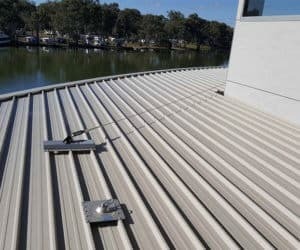 Essential Height Safety supply and install compliant and user friendly roof anchor point system that are manufactured to Australian Standard 5532 and then installed to Australian Standard 1891. 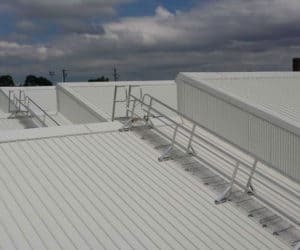 Our Roof Guard Rails and Hand Rails are designed to Australian Standards and compatible with all roof types and applications. Versatile and robust, our roof guard rails provide maximum fall prevention where the risk of a fall from height is present.